Please note: this piece was also published in The Huffington Post. It seems rather fitting that the birthday of the late Fred McFeely Rogers (1928-2003) – the renowned, award-winning creator and host of the creative children’s television series Mister Rogers’ Neighborhood – falls on the first day of Spring each year, March 20. Indeed, after a Siberian-like winter with record breaking snow in many parts of the country, we couldn’t be more thrilled to welcome a “beautiful day” into our very own neighborhood – and with it the inspiration, wisdom and life lessons of a man responsible for transforming children’s television into a positive, educational and uplifting experience. Born March 20, 1928 in one of Pittsburgh, Pennsylvania’s many ethnic neighborhoods, Fred Rogers earned his bachelor’s degree in music composition from Rollins College in Winter Park, Florida in 1951. He later went on to study at the University of Pittsburgh’s Graduate School of Child Development* and Pittsburgh Theological Seminary, where he became an ordained Presbyterian minister in 1963 with the dream of working with children and families through the use of mass media. In 1966, after a brief stint with a Canadian Broadcasting Corporation, he moved back to Pittsburgh to create and debut Mister Rogers’ Neighborhood with WQED, the first U.S. community-sponsored educational television station. The show’s first episode premiered on February 19, 1968 – nearly 50 years ago – and would continue running for 33 years, through August 31, 2001, making it the longest-running PBS series in history. Fred Rogers would go on to receive a number of awards, including the Presidential Medal of Freedom – the nation’s highest civilian honor – bestowed in 2002, a year before his death, by President George W. Bush for “his work on behalf of the well-being of children and his career in public television.” He was also inducted into the Television Hall of Fame in 1999 after receiving multiple George Foster Peabody Awards, Emmy Awards and “Lifetime Achievement” awards from the National Academy of Television Arts and Sciences. But, what was it about this man and his show that attracted such a loyal following and widespread appeal? Was it the fact that he donned a different sweater each episode, all of which were hand knit by his mother as a sign of her love? Or was it the ease and grace with which he radiated authenticity, patience and kindness? I think the answer lies in the simplicity and gentleness of his show, and the truth and honesty of his messages. As Kevin Morrison, the chief operating officer at the Fred Rogers Company, implied: it was his “freddish”-ness. 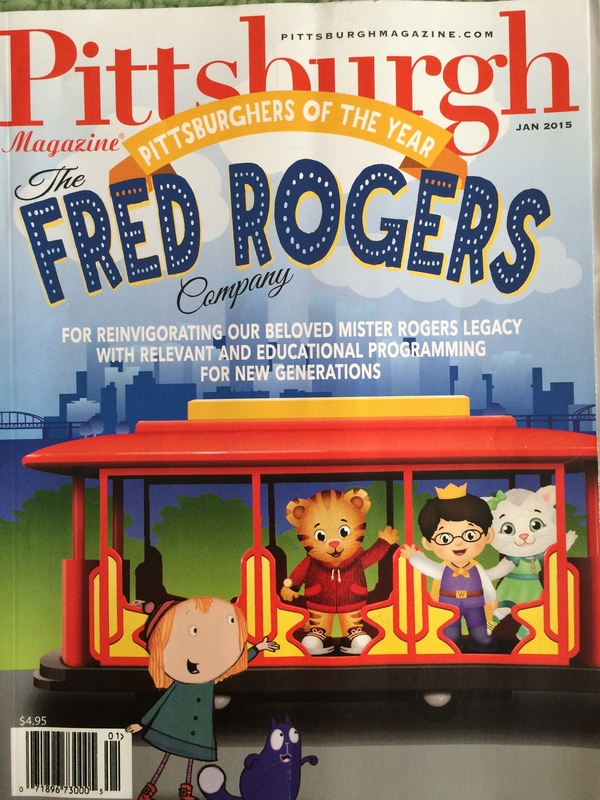 The company has had great success, most notably in its launch of Daniel Tiger’s Neighborhood – an adapted, more modernized version of Mister Rogers’ Neighborhood that debuted in 2012 (and which ranks among the top 5 shows for kids ages 2-5 every month) – Peg + Cat, which won an Emmy as the outstanding preschool children’s animated program in its first season (2013) and Odd Squad, the newest math-based series which premiered this past November. And PBS, the network responsible for airing such shows, maintains the importance of “social-emotional learning as the center of [their] curriculum framework”: “’Literacy skills are important. So are math skills and problem solving skills. But social-emotional content is threaded through every one of our properties,’” says the network’s general manager. I think this is precisely why Mister Rogers was – and continues to be – such a success. It was his interest in and concern for human behavior, emotions and needs that made him and his show so relatable, so inspirational and, ultimately, so real – particularly for children who are in the beginning stages of development. I think Mister Rogers conveyed this in his show – making each viewer feel welcome, invited and important – as if they truly belonged right there with him in his “neighborhood.” After all, the mere lyrics to his song indicate a welcoming invitation – “would you be mine?” – and an interest in the life and journey of you, the viewer. And isn’t that what we all long for? To feel welcome? Important? And that we belong? And so, it is on this first day of Spring – as the flowers begin to bloom and we enter into a season of rebirth, renewal and restoration – that we remember the warm, gentle and loving spirit of Mister Rogers and wish him a very happy birthday. May we make the most of this beautiful day, may we kindly invite others and remember to say: won’t you be my neighbor? There was a lot happening during this time in the child development field around the Pittsburgh area, due largely to Dr. Benjamin Spock (author of the most famous child rearing book, Baby and Child Care, which by 1998 had sold more than 50 million copies world wide, making it one of the best sellers of all time). Dr. Spock taught pediatrics at Cornell University from 1933-1944 and later at the University of Pittsburgh from 1951-1955, making early discoveries in its lab school. He established a family and children’s center in one of Pittsburgh’s Eastern European neighborhoods as a pediatric training ground which attracted the field’s most innovative thinkers, including famed developmental psychologist Erik Erikson. It was in this innovative and forward thinking atmosphere in Pittsburgh, Pennsylvania that Fred Rogers went on to create his award winning “neighborhood” show. Continue delving into all things Mister Rogers with these 10 inspirational quotes from “Life’s Journey According to Mister Rogers” that are sure to add a little “spring” to your step. Just seeing the first few lyrics of that theme song brighten my day! You’ve summed up his charm and appeal in this entire piece, and more precisely in three words: “ultimately, so real.” We talk a lot about the importance of realness and what makes someone genuine. Here’s an example of someone who perfectly, and quite simply, embodies ingenuousness. What a great way to put it, ‘his freddishness’. I grew up on his shows and in my adult life feel like I need some more freddishness in my everyday life. Who out there today is carrying his torch?